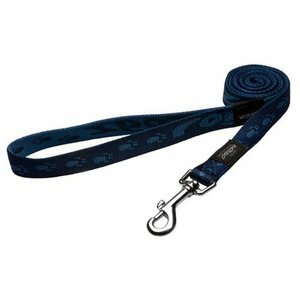 A solid blue soft webbing nylon dog leash with a snap hook. In various sizes available. This blue dog leash comes of the series "Alpinist". This series had been designed for the adventurous dog owners who like to take their furry friends with them through rough terrain. The dog collars, dog leashes and dog harnesses are of excellent quality and made of soft webbing nylon. The dog leash is made of soft webbing nylon, so it is very soft for the dog and for your hands, and reinforced with round plastic components. The dog leash is made of sturdy nylon and has a strong snap hook.